Moon and Son is a 13-episode BBC series created by Robert Banks Stewart (Doctor Who, My Uncle Silas), which follows a professional fortune teller, Gladys Moon (Millicent Martin), and her son Trevor (John Michie) as they solve a multitude of mysteries. The series stars Millicent Martin (Alfie, Return to Halloweentown, Days of Our Lives, From a Bird’s Eye View), John Michie (Coronation Street, Taggart, To Walk with Lions), Laure Killing (A Woman’s Revenge, The Violent Earth, Paris Criminal Inquiries), Ian Redford (The Remains of the Day, 3 Men and a Little Lady, Mary and Martha), Patrick Drury (The Awakening, Father Ted) and John Fitzgerald Jay (Roujin Z, Reign). 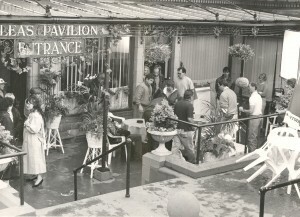 The production filmed at a variety of locations in Kent and in Nord-Pas-De-Calais across the Channel. 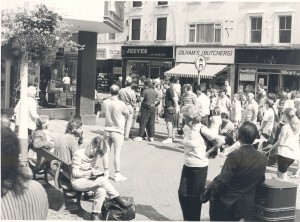 Folkestone is the main UK setting and hometown of the Moons. Folkestone Harbour is also used frequently as the Moons travel between Folkestone and Boulogne. The Folkestone area has been used for previous productions including The Tunnel (2013), Everyone’s Going to Die (2013) and Mud Men (2012). Wittersham Road Station, which is part of Kent and East Sussex Railway, features as a hideout in episode two. It is a versatile historic railway that boasts an extensive list of production credits including Mapp and Lucia (2014) and Last Passenger (2013). 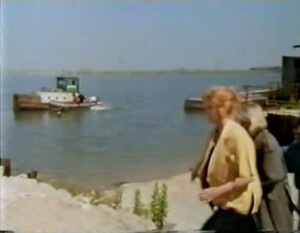 The Oare Marshes appear as the location for Mr Marsh’s (Gregory Floy) business in episode two and again as the quarry lake where his body is discovered. The Oare Marshes is a reserve consisting of one the few grazing marshes left in Kent. Other productions to have filmed there are A Taste of Britain (2014), Channel 4’s Southcliffe (2013) and Great Expectations (2012). Chilham Castle, a historic building set in the Tudor village of Chilham features as Lady Doddington’s Estate in episode nine of the series. 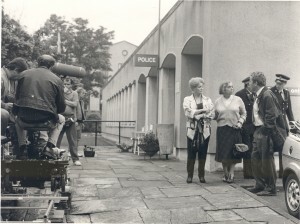 The village of Chilham has welcomed other productions including BBC’s Emma (2009), Miss Marple – The Moving Finger (2006) and Dempsey and Makepeace ‘Cry God for Harry’ (1985). 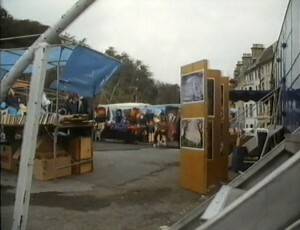 Crabble Corn Mill also features in episode nine as Denham’s Auction House. Recognised as one of Dover’s hidden treasures, Crabble Corn Mill is one of the most complete working Georgian watermills. Dover has often been seen on screen, in particular Dover Castle, in productions such as The Apprentice (2015), Avengers: Age of Ultron (2015) and The Other Boleyn Girl (2008). The Old Boatmen’s Room on Deal’s Marina doubled as Basil’s Chapel in episode 10. Deal boasts a stunning seafront and pier, as well as two Tudor castles and a thriving high street. 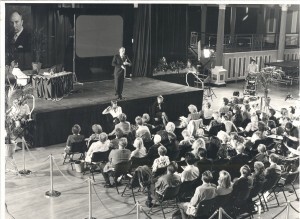 Other productions to have filmed in Deal include Legacy (2013), Great British Railway Journeys (2010) and Ruby Blue (2007). 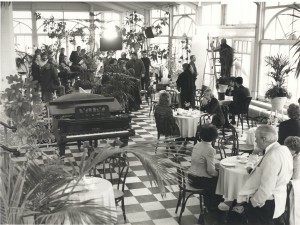 Other locations that appear in Moon and Son include the palm court at Folkestone’s The Grand, which features frequently as Gladys’ preferred haunt for tea. 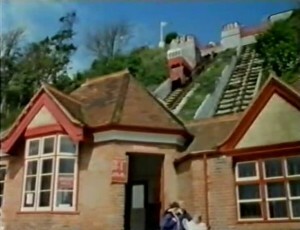 Additionally, The Leas Cliff Hall is home to the final show down of episode two and The Romney, Hythe and Dymchurch Railway features in episode twelve as the location of hidden diamonds. Moon and Son aired in 1992. 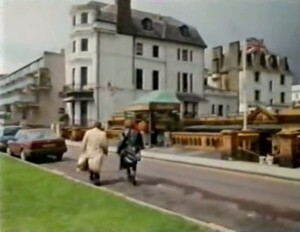 This entry was posted in Filmed in Kent and tagged Chilham Castle, Crabble Corn Mill, Deal, Dungeness Estate, Folkestone, Folkestone Harbour, Hythe and Dymchurch Railway, Kent and East Sussex Railway, Moon and Son film locations, Oare Marshes, The Grand, The Leas Cliff Hall, The Romney, TV Drama. Bookmark the permalink.